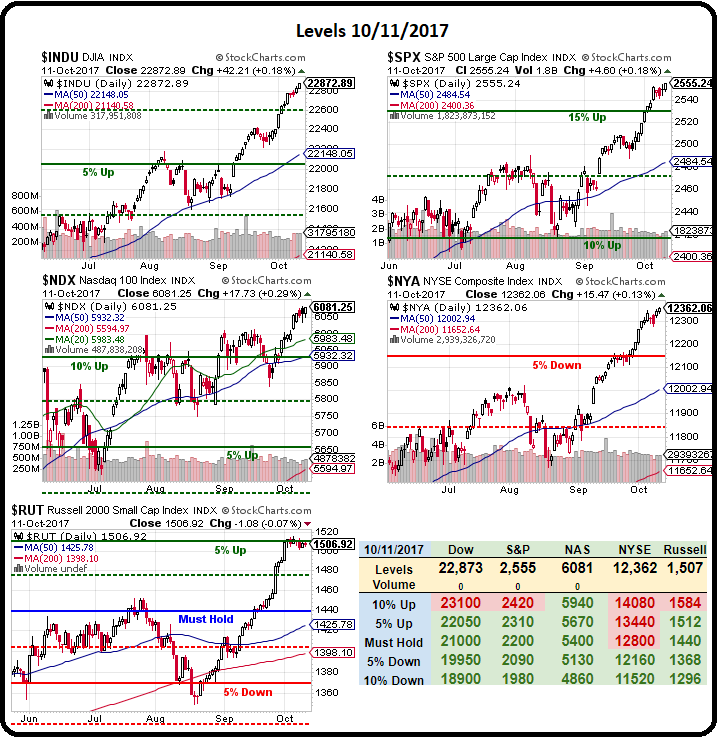 That's all it took this morning to blast the Dow 130 points higher pre-market. Caterpillar (CAT) was up $10 (7%) and that added 85 Dow points and 3M (MMM) jumped $8 (3.5%) and added 64 points so that's 149 of 130 points added by just 2 of the Dow's 30 components – the rest are net negative. What a silly index! The combined market cap of CAT and MMM is $200Bn, only as much as GE but if GE dropped 10%, that would only subtract about 20 Dow points, because GE is a $22.50 stock. So a $22.50 stock worth $200Bn dropping 10% on the Dow has 1/7th the impact of 2 other stocks with the same TOTAL market cap rising an average of 5.75% between them. That doesn't just not make sense – it's stupid! 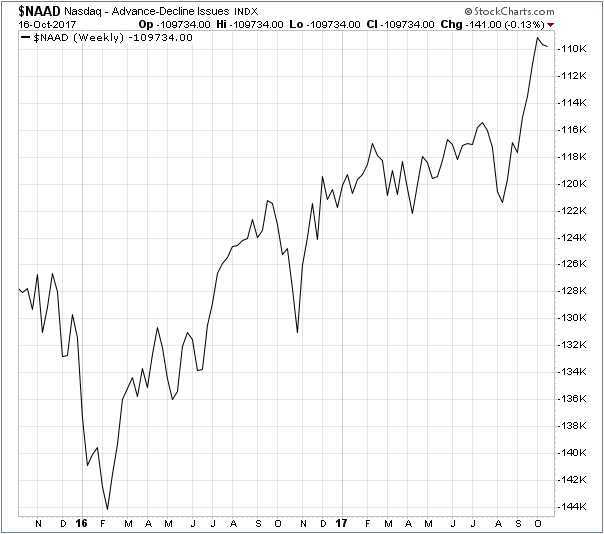 Think how easy it is to manipulate an index that has those kind of price distortions. Fortunately, we love these easily manipulated distortions. 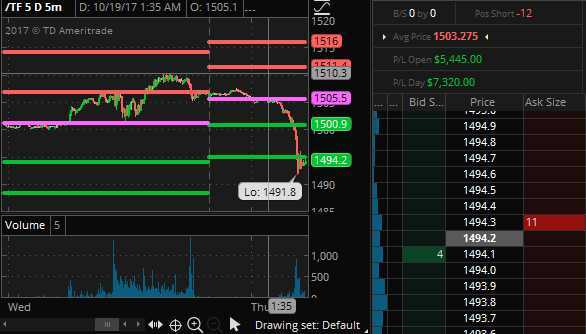 Yesterday morning, in our Live Member Chat Room, we shorted the Dow (/YM) Futures as they tested 23,300 and we got a great drop to 23,225 which was good for gains of $375 per contract. 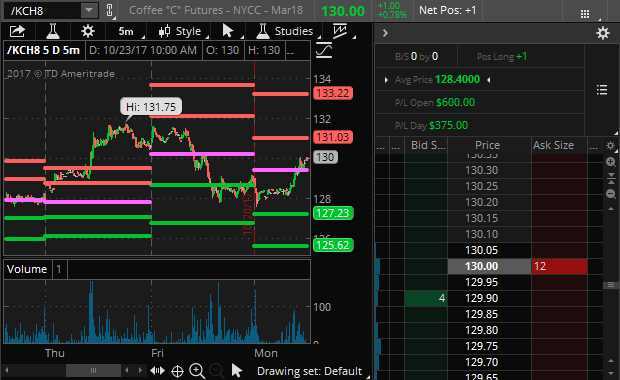 Even if you don't have access to the Member Chat Room, in our morning's PSW Report, we gave you the long trade idea for /KC at $1.28 and that was good for $375 per contract by 10 am (and today it's back and we can play it again). Silver (/SI) is back to $16.90 and that's down 0.40 from Thursday's close but back to where we went long on Wednesday so why wouldn't we play it again (with tight stops below) as it was a $1,500/contract winner last time? 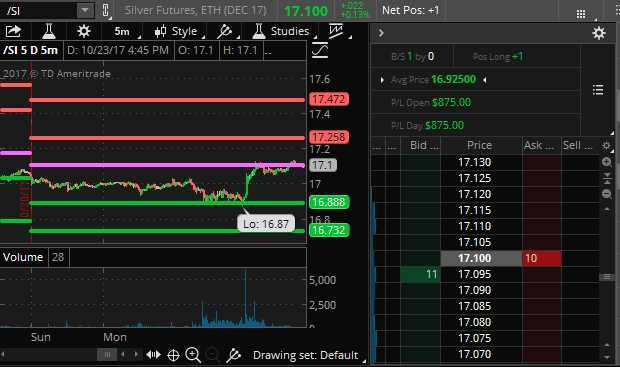 $16.75 should be the low-low, so that's where I'd look to try again if $16.90 fails and we'll follow up on this one into Wednesday's Live Trading Webinar. As you can see from the chart, the Nikkei is up 600 points (2.8%) since Thursday's close as Prime Minister Shinzo Abe's party retained its 2/3 majority in the Diet (Parliament) – though it doesn't REALLY matter as Japan, like the US, is actually controlled by large Corporations. “Corporate Japan is determined to play a role in rebuilding our economy and is cooperating with the Abe administration’s strategy,” Sadayuki Sakakibara, chairman of Japan’s main business lobby Keidanren, said in a statement.. Either way, the end result is a continuation of Japan's ultra-easy money policies that have led the nation to over 1.2 QUADRILLION Yen of Debt, which is $12.5Tn(ish) and 250% of their annual GDP. The reason no one is worried about the US being $20Tn in debt is because it's "only" 110% of our GDP and that means we can borrow another $20Tn and STILL look better than Japan but Japan is a ticking time bomb, where 24.3% of Government revenues went to debt service alone last year – and that's at these ultra-low interest rates. Japan, by the way, like the US, gets 41% of their tax revenues from the Social Security contributions of an aging population and only gives back 17.9% but the people don't seem to mind – they just voted for much more of the same. Japan is able, so far, to sustain their massive debts because their current borrowing rate is essentially negative. The Japanese people and even the Corporations consider it their duty to support the Government by buying bonds, and they do so at any price – even when the rates are costing them money to save. 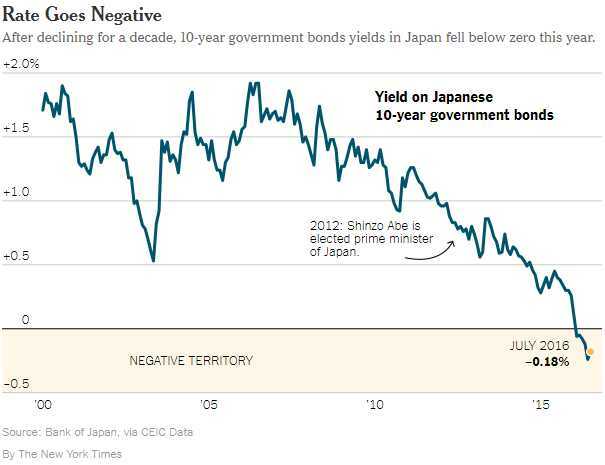 Things will be fine for Japan as long as the rates stay below 0.5%, where they have been for the last 5 years but, over that, and the share of debt service goes up 12.5% with each half point of intererst – Japan is one credit downgrade away from a real catastrophe. GE (GE) dropped guidance by 33%. Not sure why I bother mentioning it, it's only a $200Bn leading industrial company so why shouldn't the Dow be up 100 points pre-market? Makes perfect sense, right? GE is a Dow component but it's stock is only at $23.50 so a 6.5% drop to $22 is only $1.50 and that's just 14 Dow points vs a 10% drop in IBM being $15 and adding 127 points the other day. Get it? No, nobody does, but it's still our leading market indicator so just play the game and don't ask too many questions. We have been long on GE since June 27th and we have 2,000 shares at $27.40 in our Long-Term Portfolio but we sold the 2019 $25 calls for $3.75 and the $28 puts for $3.10 so our net entry on 2,000 shares was $20.55 but, if we get assigned another 2,000 at $28 (seems likely now), we'll have 4,000 shares at an average of $24.275. Of course, then we will sell another round of calls – the 2019 $23 calls are now $2.40 so hopefully we'll get more like $3.50 for the 2020s when they come out. That will keep our basis around $20 while we collect GE's fat 0.94 dividend so, as long as they don't cut it, we're happy to accumulate down here. 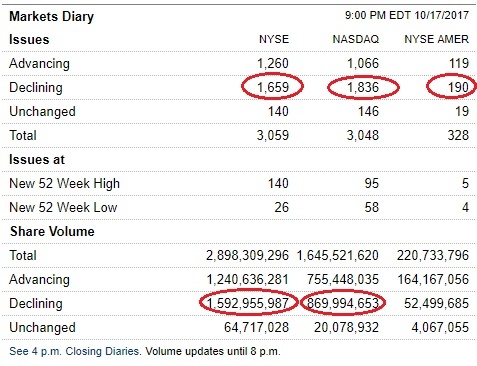 Either GE is going the wrong way or the Dow is and, this morning, we shorted the Dow Futures (/YM) in our Live Member Chat Room at 23,200. If it turns out the Dow SHOULD be up 28% for the year, then I have to believe GE will find a way to reverse their 20% decline over the same period. 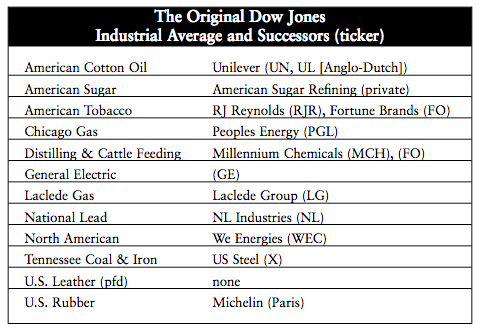 It's not just unusual that GE would diverge from the Dow by over 40% (almost 50% now) – it has NEVER happened, in the entire 121-year history (1896) of the Index (GE was one of the original 12 companies). Never is a long time, folks – this time sure is different, isn't it?